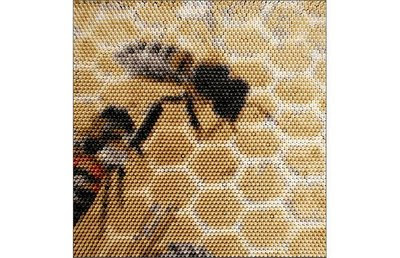 Picture made by using wax crayons as pixels by the artist Christian Faur. The distinctive hairs on this butterfly allowed Natural History Museum scientist Blanca Huertas to identify it as a new species. You can read more here. I have been thinking about writing about Passiflora and associated insects (particularly Heliconid butterflies) for a while, when I saw this trailer for THX before a film I wanted to watch. I'm pretty sure it's based on Passiflora caerulea. A male Saturnia albofasciata moth emerges from its cocoon in this time lapse video. The cocoon was partially cut away to observe development and movement and doesn't seem to bother the moth. After the moth emerges, he expands his wings by pumping his body fluid into them. 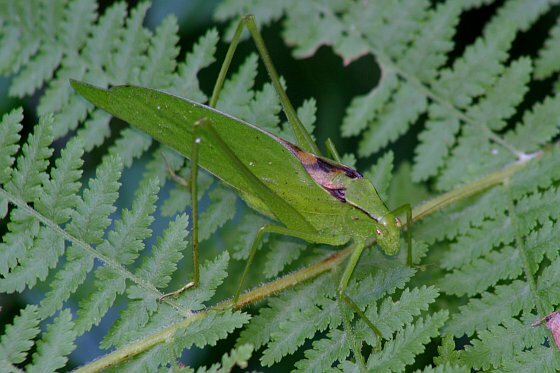 The Oblong-winged Katydid, Amblycorypha oblongifolia, is generally leaf green, although ocassionally tan or bright pink. 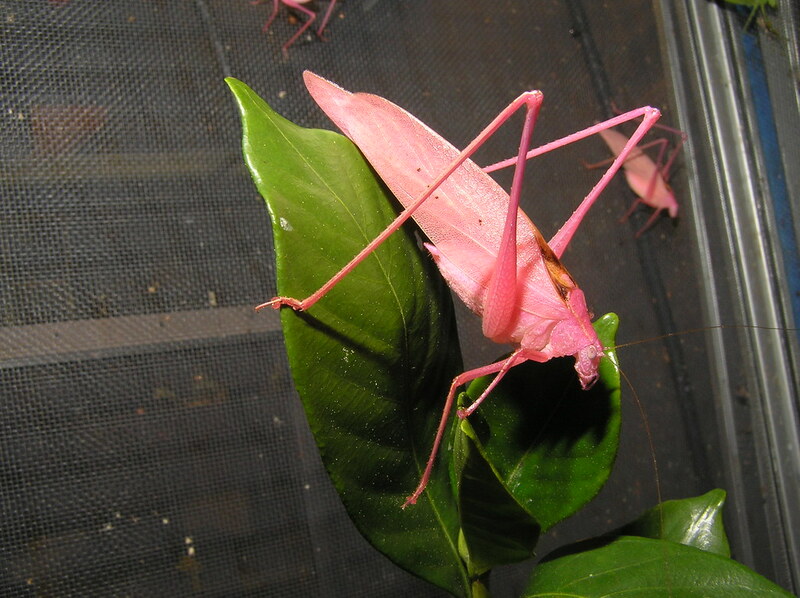 The Audubon Insectarium, New Orleans, recently successfully bred some of the pink form. There are more photos here. The insects feed on the leaves of woody deciduous plants and range from the Quebec province of Canada to Pennsylvania, from Pennsylvania SW to Texas, and from Texas N to Nebraska. 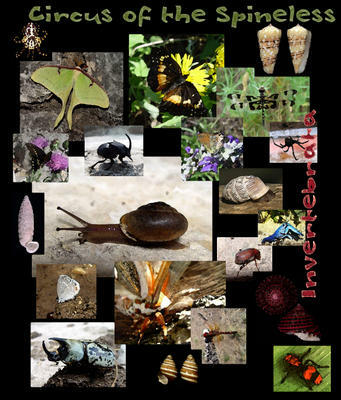 You can you this link to follow Invertebrate Diaries using NetworkedBlogs on Facebook. So all of you Facebook-ites please do so (consider it a favour for me) . This post marks the beginning of something I've been meaning to start for a long time: blogging about peer-reviewed research. The Research Blogging site has some cool features for doing this, and so this is a bit of an experiment into how all of that works. The first paper is on ants, an invertebrate certainly, but not one I'm an expert on. The reason it appealed to me, I think, boils down to seeing a talk by Bert Hölldobler (of Hölldobler & Wilson fame) recently at the Natural History Museum. I was also once a physicist, and we like such things. First some background, the 'blue butterflies' are in the family Lycaenidae. This family is well known for its association with ants. The caterpillars actually live as social parasites within the nests of ants (they get the ants to feed them, they don't feed on the ants). Ants primarily communicate with each other via chemicals (hydrocarbons) and physical contact (Hölldobler's talk showed some fascinating videos of physical interactions). The caterpillars can replicate the chemical signals used by the ants, causing the ants to carry them into their nest and feed them as they would their own young. But that's not the whole story. If an event happened which required the ants to rescue their larvae, they would actually rescue the blue butterfly caterpillars over their own children. Indeed if food becomes scarce the ants will kill and feed their own larvae to the caterpillar. The queens of the ant nests may treat the invader as a rival, whilst the workers treat it as royalty. This paper explains how this happens. The species of ant used in the study, Myrmica schencki, can make stridulatory noises that vary between workers and queens. It is by mimicking these noises that the butterfly caterpillar, and pupa, persuades the worker ants of its high value to the colony (by sounding more like a queen than a worker). There are probably aroun 10,000 different species that parasitise ant nests, so there is plenty of scope for further work to see how widespread this phenomenon is. New circus of the spineless is available here. Some of the posts are pretty old, but certainly worth a read. Great new logo is above. I'm glad I have something positive to say about something snail related after my last post! I've been having a bit of a heated discussion with the guy who maintains (maintained?) petsnails.co.uk. This is a site that I really like and that originally put me in contact with many of my gastropod friends (that's people interested in gastropods, not the gastropods themselves). I was shocked however to find that my e-mail address has been published on the site for a while (this was a bout a year ago). When I contacted the guy in charge he said he'd look into it. Just in case you aren't up on the subject, here's a randomly selected link that explains why doing this is bad. So just over a year later I ask the guy again, and he seems reluctant to make the necessary changes, and doesn't think he needs to. Well, I'm sure you can see the need (if not you should have read the link above). So, what can you do about this? The answer is a contact form. I have one here. These are easy to implement, and there are numerous pre-coded examples around, for free. So I don't really see what the issue is, besides his time (which it would take less than half an hour of). I don't think I was out of order asking for this, but given the flaming tone of the response I got, I guess it might have been. If you use petsnails.co.uk and agree with me I would ask you to e-mail the site administrator saying so. Invertebrate Diaries will be hosting Circus of the Spineless on the 2nd of March, 2009. This is the first time that a blog carnival has been hosted at this site, and I'm looking forward to it already.